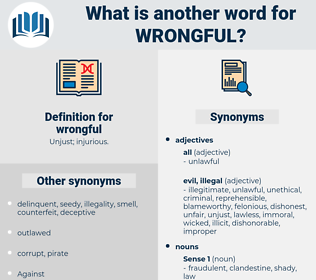 What is another word for wrongful? 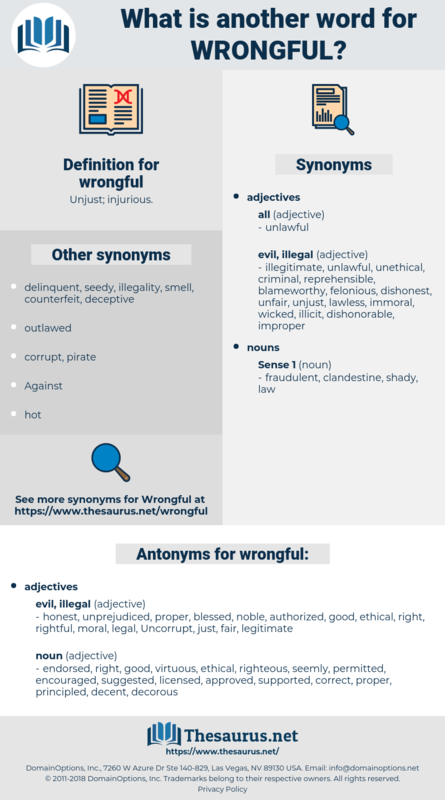 inappropriate, impermissible, erroneous, unwarranted, fraudulent, lawless, unjust, abusive, delictual, incorrect, unruly, reprehensible, unauthorized, false, unauthorised, unjustifiable, unreasonable, irregular, illicit, vexatious, faulty, misleading, law-breaking, misguided, undesirable, harmful, inaccurate, flawed. honest, unprejudiced, proper, blessed, noble, authorized, good, ethical, right, rightful, moral, legal, Uncorrupt, just, fair, legitimate. encouraged, supported, righteous, approved, decent, correct, seemly, virtuous, decorous, suggested, permitted, principled, licensed, endorsed. I who am no friend of strife or wrongful quarrel will bear him this witness even with a solemn oath, and the sweet voice of the Muses shall not say me nay. Sovereigns have always enjoyed immunity from suit by private persons, unless they have been pleased to assent thereto, not because it is less wrongful for a sovereign than for an individual to cheat, but because the sovereign cannot be arrested and the individual can.